Joseph Stalin meets the medieval Gothic Cathedral and here’s the unholy offspring of that union! On my recent post explaining the expression from the lips of Jesus Christ “ye are gods”, a comment has appeared from an anonymous reader called identifying himself or herself as A.K. saying that I am wrong in my take and that the Mormon view (which I actually did mention in my article but discounted it in passing without going into much detail) is correct. 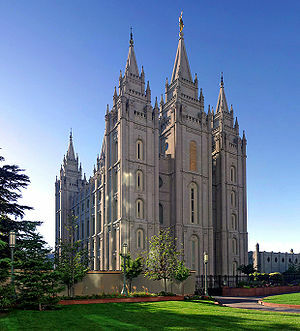 I wanted to highlight this correspondence so I have made a main article for this blog from it in the hope that more people will be reached and brought to an understanding of what Mormonism really is, who it belongs to and why it exists. Given the fact that Mormon Mitt Romney seems to be in the running to become the most powerful man in the world, the President of the United States, now seems as good a time as any to deal with the question of Mormonism openly on this blog. We have already discussed Watchtower at an earlier date, and now we are doing another organisation (not the last of them by any means) whose origins, theology and modus operandi can be traced into masonic occultism and therefore via that can be traced back to the devil himself. Here is the comment by the anonymous viewer and afterwards to the end of this article is my response. There are one or two embellishments here that weren’t in the original reponse just because I have had fresh ideas to add, edits to make and also because I wanted to link here to some video, which I couldn’t do in the original response. Not really, [presumably referring to my final words in the article “hope that was helpful”] your reply is nothing but psychological evasion. God or Jesus doesn’t say anything about earthly rulers or kings you just interpreted it that way. Jesus was amongst regular Jews, at the time there were no Jewish King or Rulers, the Romans owned the Jews. In fact Jesus said it is”written in your law” meaning the very essence of your being is Godly. Aren’t we made in God’s Image? Didn’t God breathe his “breath” in us to give us life? In terms of false Gods, it was meant for those who claimed they were The way to salvation and not Jesus, but God AND Jesus said the same thing. Stop trying to create illogical conclusions from obvious words from God and Jesus. God is in the business of fashioning Gods. Well, like I said in that article, that is the take that Mormons make on it. It goes along with their general theology that God makes gods who go on to become gods of their own. This is a Book of Mormon idea, that the course of the Lord is “one eternal round” (Alma 7:20, Alma 37:12, 1 Nephi 10:19) but in the real Bible the course of history is never considered as a cycle, but as a line with a clear beginning and an ending, from an initial Creation to a final Resurrection, and the end-time events, closing off with the Resurrected Kingdom being handed by Jesus to the Father so that God may be all in all. Jesus is shown to Man as Alpha and Omega, the first and the last, and not, like in a multi-tome encyclopedia Aa-Cr, with many more volumes to come. His is the Name above all names, both in time and in Eternity. The appeal of the Mormon theology to the natural, self-centred mind of Man is clear. Biblical theology about a linear plan of creation and redemption talks about a time line which is a one-off, and after that eternity – but we cannot envisage eternity. And so the real Bible never attempts to answer questions such as where God came from, what He will do next after this creation is finished, etc. This leaves unanswered questions which people naturally find hard to deal with and so they seek ways to “tidy up” the theology and give snappy answers to doubters also, as we all know how atheists like to try to stump theists by asking about eternity which none of us have experienced neither can we envisage. I’ve just finished watching the main Polish news programme of the day, the evening “Wiadomosci” programme on TVP1, which had as its closing story information about how in Poznan there has been a blitz on people who have dogs and haven’t paid their dog tax. Dog tax is a local tax in Poland, some municipalities charge it and some don’t, and there is a degree of freedom as to how much can be charged, and in Poznan that amount is 55 PLN/year, which is about $16 a year. This is more than I can remember from the UK, but dog tax was abolished there many years ago. During my childhood the amount was a good deal less than that, but maybe comparable if you account for inflation. The question asked, and answered, in the news broadcast, was how the authorities knew where these dog owners were in order to charge them and take them to court for their missing payments of dog tax. The answer is, some time ago the municipality had a free chipping exercise for dogs whereby owners were given a free ID chip so that their dog could be returned to them in the event of loss. This you can have from any vet, by the way, but then it is a paid service. Not thinking that there is no such thing as a free lunch, and taking this inexplicable magnanimity on the part of the City at face value, Poznan citizens queued up and took part in the action and had their free ID chips with their addresses and telephone numbers, which of course were all put in a big database and reported to the City. The news report didn’t go into detail as to whether these people had signed anything which allowed that to happen or whether it was simply an abuse of privacy and a breach of the Data Protection Law, but when has that ever bothered government anyhow? It’s the little man with his business that has to worry about that, and not the governing elites. “Ye are gods” – what does this mean? I want to ask you about something, if you are healthy enough to answer. What does Psalm 82:6 mean? Of course, this is connected to John 10:34 as well. And on the same topic, who are the “sons of God” in Genesis and Job? This topic may look like one topic, in a sense there is an element of being related, but in fact I would regard these as two separate issues. Let’s deal first with the issue of Psalm 82:6 and John 10:34. 82.2 How long will ye judge unjustly, and accept the persons of the wicked?